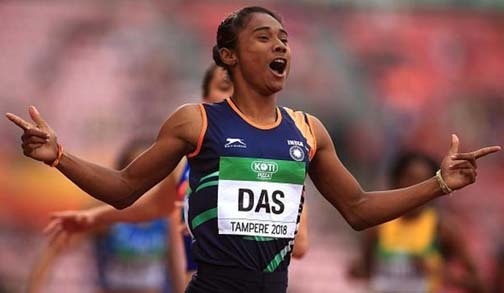 Assam’s golden girl Hima Das has arrived in New Delhi from Jakarta on Monday. She will be meeting Prime Minister Narendra Modi and Union Minister of Sports Rajyavardhan Singh Rathore in Delhi. She is set to come to Guwahati on Friday. A state-level felicitation will be organized at Srimanta Sankardeva Kalakshetra where CM Sarbananda Sonowal and other dignitaries will be present on September 7. She has been in limelight after winning one gold and two silver medals at the recently held Asian Games also known as Jakarta-Pelambang 2018. Due to protocol Hima refrained from speaking to the media present at the airport. Earlier she was welcomed by former Assam minister and President of Assam Athletics Association Rockybul Hussain at The Ashok Hotel, New Delhi. Congratulatory messages poured in from across the country lauding the stupendous victory of Indian women team at the relay.